The schedule of six race meetings organised by Abingdon-based MG Car Club is detailed below. All offer a varied and interesting programme of races, with a combination of their own championships and other invited championships and series. :: Easter Sunday 8 April: Donington Park. :: Saturday & Sunday 23/24 June: Silverstone - MGLive! :: Motoring Classics Thoroughbred Sports Car Championship. This two-day meeting will be run on Silverstone's Arena F1 GP circuit; the feature race will be the official MGB50 celebration race for FIA-spec MGBs. Anyone with an eligible MGB who would like to take part in this historic race at the world's largest gathering of racing MGs please contact Dave Saunders by email at h.davesaunders@btinternet.com. MGLive! 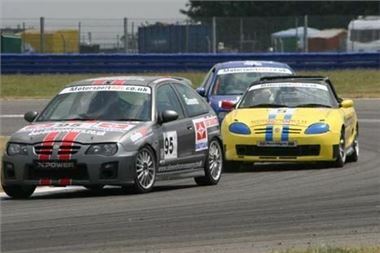 - the world's largest MG event - returns to Silverstone for the 62nd successive year. Organised by the MG Car Club, this annual jamboree attracts enthusiasts from around the world and has developed into a truly international celebration of the marque. In 2012, MG Live! pays homage to the MGB, first produced in 1962, by staging a Saturday lunchtime street party, to which all current owners of MGBs are invited.